When MUA brought these out I was quite excited. I was just getting into lip glosses more and for only a £1 I knew I was going to pick a few up! I was hoping for good things but sadly I was disappointed. The swatches look encouraging, don't they? Do not be fooled by the colours though because as soon as you apply these to your lips they all look basically the same shade! This is the case unless you build them up a lot but they are very uncomfortable when built up that thick. I also found these glosses to be a bit sticky and this is the thing that put me off trying lip glosses in the first place! The smell isn't to my liking either, its quite sweet and strong to me and off putting. All in all I didn't get on with these lip glosses but at only £1 its no big loss. I wouldn't recommend these to anyone but if you're looking to try some new lip glosses I'd turn to the Intense Kisses Glosses from MUA, they are £1 more but worth every penny. You can read my review here. I'm usually a fan of MUA but I got a lipgloss from them for free with another purchase last year and I'm definitely not a fan of their lipglosses! Terrible! Sorry to hear. I am glad that you did this review though. Most people only review super expensive things, and we know some people just afford them. 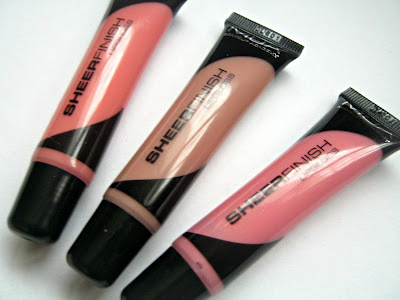 I am not a fan of lip glosses anyway, so I'll stay away from these. I love their lipsticks, though! I am not really a big fan of MUA make-up. I only have their eyeliners because they are VERY dark and inexpensive. shame they don't show on your lips though!